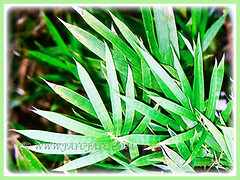 Medium-sized Chinese Dwarf Bamboo or Clumping Bamboo is the most colourful of all the multiplex cultivars in existence. Above its culms, it is covered with captivating green to olive green and linear foliage. Its densely compacted culms is an excellent choice to create an almost indestructible hedge and privacy screen. Botanical Name: Bambusa multiplex (syn. : Bambusa albifolia, Bambusa nana, Bambusa alphonse-karrii). 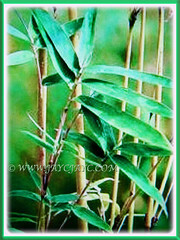 Common Names: Clumping Bamboo, Hedge Bamboo, Chinese Dwarf Bamboo, Buluh Pagar in Malay. Origin: Native to South China, Nepal, Bhutan, Assam, Sri Lanka, Taiwan and northern Indochina. 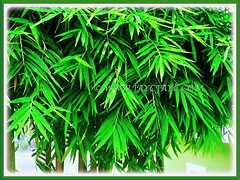 Plant type: An ornamental, evergreen and perennial bamboo plant. 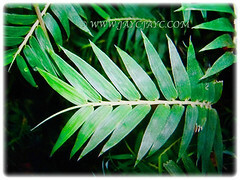 Features: Bambusa multiplex is from the genus Bambusa that consists of 132 accepted species of plants. It is a fast-growing, clump-forming and erect bamboo that can grow between 11-14 m tall, though typically reaches half its height. Spread of the bamboo is slow since the rhizomes grow only a short distance from the clump before sending up new culms. 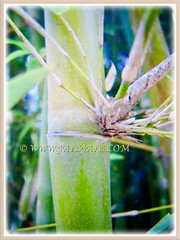 The bamboo canes vary in size but are generally slender, smooth with no spines and sometimes arch gracefully. 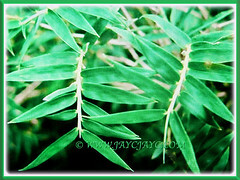 Above the lovely canes are borne the green to olive green and linear foliage that are densely clustered at the branch tips and have entire leaf margin. The underside of leaves are silvery in colour. Its bright yellow culms or wood-type stems with irregular dark green stripes are thin and 4 cm wide. The inconspicuous flowers are hermaphrodite, that is, having both male and female organs. Flowers are similar to that of other grasses and pollinated by the wind. Fruits are grain-like. While it will spread, its movement is nowhere near as fast since its rhizomes are shorter than those of the common bamboo. 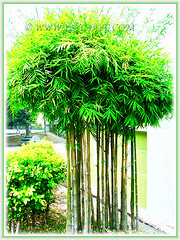 Culture (Care): Bambusa multiplex or Clumping Bamboo can be grown easily with least maintenance. Moisture: Moderate water requirements. Water regularly to keep it moist but do not overwater. It is fairly drought-tolerant once established. Others: Prune if needed. It can be trimmed well to be slightly A-shaped. Watch out on its spread and remove any rogue stems. Remove root suckers as they develop and control unwanted weed growth with root mulch. Feed it with a balanced fertiliser with a ratio of 10-10-10 that contains micronutrients four to six times annually. Alternatively, use a slow-release, water-soluble or foliar fertiliser. Generally free from serious pests and diseases. Nevertheless, watch out for scale insects and mealy bugs. 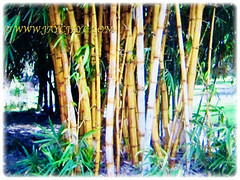 Bambusa multiplex or Hedge Bamboo is cold hardy to -7.77°C. A fairly hardy plant, tolerating temperatures down to about -8°C but it does not like periods of prolonged cold. A dwarf variety of the attractive fern-leaved bamboo that’s suited for most gardens as it only grows to about 4-6 m. It’s a bamboo plant that thrives outdoors in a number of conditions, down to -11°C. As with most clumping bamboos, growing in containers can restrict the rhizome growth and prevent it from reaching their full growth potential. Thus, a wonderful choice for brightening up a well-lit indoor room, patio or deck. It needs a position sheltered from cold drying winds. Requires abundant moisture during the growing season and warmer months with lots of organic matter in the soil. The rootstock is caespitose with new shoots appearing in late spring. Propagation: Easily propagated from seeds though rarely available. Alternatively, it can be propagated by removing its rhizomatous offsets with long roots or by division of the clumps, taking at least 3 canes. 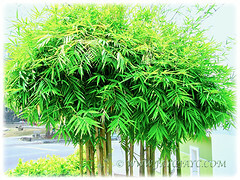 Usage: Bambusa multiplex or Chinese Dwarf Bamboo with its densely compacted culms makes an excellent and almost indestructible hedge and privacy screen. 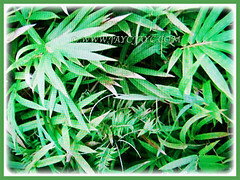 Grow this beauty as a specimen or accent plant in your garden. This medium-sized Clumping Bamboo will be most suited for container gardening. Paper is made from the culms. The canes split easily and are fairly flexible. Thus, they are used as a source of weaving material for mats, baskets and other household goods.